The first transcontinental railroad built in the late 1860 and was completed in 1869 by Central Pacific and Union Pacific railroad companies. Since 1859 the most westerly railroad from the Atlantic coast reached Omaha, Nebraska. To connect it with the Pacific coast the Central Pacific Railroad was built from Sacramento, California eastward ( laid 690 miles of track) and the Union Pacific Railroad from Omaha westward ( laid 1086 miles of track) , until they met at Promontory Summit in the Utah Territory. Railroad construction was limited largely to double-tracking. The US standard railroad gauge (distance between the rails) is 4 feet, 8.5 inches. Passenger service in the United States was greatly improved during the 1930s, when lightweight, streamlined cars, air conditioning, and faster schedules were introduced. 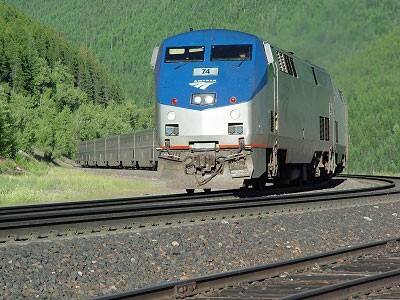 By 2001 Amtrak carried over 24 million passengers and operated some 440 locomotives and almost 2,200 passenger cars over more than 35,000 route km (22,000 route mi) across the United States . 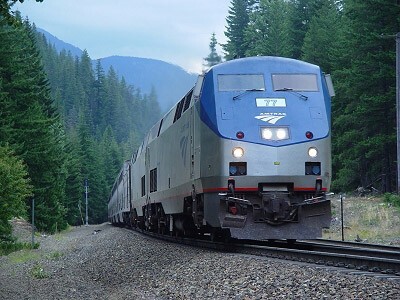 Amtrak runs a daily service from Emeryville, California to Chicago, Illinois along this railroad. The trip takes some more than 2 days.